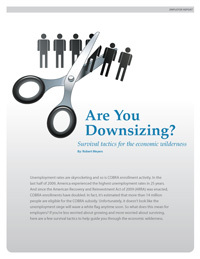 Planning to downsize or lay off employees? Make sure COBRA is covered! This is a make or break time for many employers. More than ever before, you’re challenged to creatively do more with less. By staying informed and proactive, you can discover greater efficiency, smarter solutions and sustaining survival strategies. Complete the short form to the left to get this valuable information today.